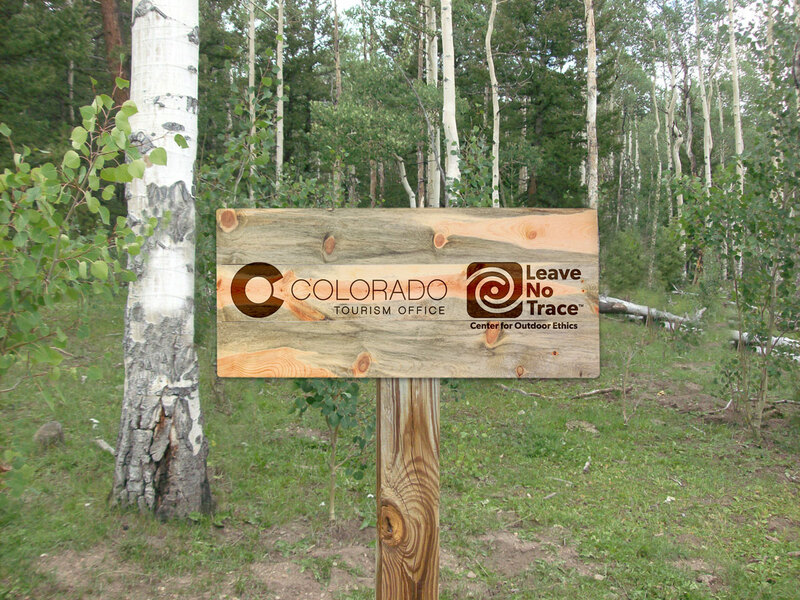 This message for Colorado travelers was developed in a partnership between Leave No Trace Center for Outdoor Ethics and the Colorado Tourism Office. This land really is your land. Our state and federal agencies manage 42 percent of Colorado’s majestic landscape, and our cities and counties maintain even more. Learn about and respect the spaces we all own, share and sing about. Stay back from the pack. Find your way to less-visited and off-peak destinations to minimize down time and maximize your connection with special places. Bring along reusable water bottles or hot drink tumblers to limit waste and stay hydrated in our dry climate. With 39,000 marked trails and 13,000 designated campsites, there’s no need to venture beyond. By sticking to these areas and camping at least 200 feet from lakes, rivers and streams, you’re helping natural areas stay natural. Even though shortcuts can be tempting, please don’t take them. A few extra strides on the path will protect plants and the homes of the true locals. Pack it in, pack it out. Or pick it up to leave a place better than you found it. Put litter, even crumbs, peels and cores in your nearest waste/recycling bin. Wash yourself, your dog or whatever else needs cleaning at least 200 feet from waterways, and use biodegradable soap. A bubble bath is no treat for fish. Leave plants, rocks and historical items as you find them so others experience the joy of discovery. Any of our 750 different species of wildflowers will live forever in a photo. Snap away, but only with a camera. Colorado is beautiful all on its own. Building structures or campsites on public land isn’t cool. Keep it pristine for everyone to enjoy. Treat all living things with respect. Carving or hacking plants and trees may kill or disfigure them. Colorado’s low humidity has perks, but can create dry, dangerous conditions. Keep campfires small and manageable to avoid sparking wildfires. When putting out a fire, water it until you can handle the embers. Never let a fire burn unattended. Use care when smoking in Colorado’s dry climate. Always put cigarettes out completely and don’t leave your butts behind. Always check for local fire restrictions. Colorado is home to tens of thousands of furry, scaly and feathered creatures. To keep them – and you – safe, don’t approach them. It is not adorable to feed wild animals. You could alter natural behaviors, exposing them to predators or even euthanasia. Keep your furry buddies leashed when enjoying dog-friendly trails, and pack out their waste. All the way to a trashcan. Chances are you’re not out in nature to people watch, so try out the lesser-known paths and sites. Silence your cell phone before stepping into nature and speak softly without using the speaker function. Be considerate when passing others on the trails and yield to the uphill hiker and biker – they need the momentum. Listen to nature. Keep your voice and music soft so all can enjoy the peace of Colorado. The following organizations have joined in partnership with the Colorado Tourism Office and the Leave No Trace Center for Outdoor Ethics. Learn more about the partnership and how you can promote the Care for Colorado Principles in your organization.